Comparing Apples to Doughnuts | Fit Family Robinson | The world is your gym. Dad, can we have a doughnut hole? I’ve heard this question at least five times a day for four straight days. 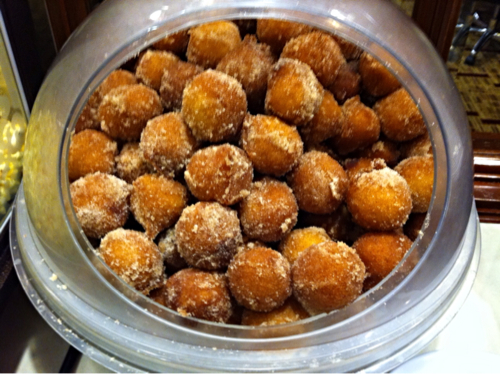 We are staying at the Courtyard Marriott in Palo Alto, CA and a big platter of sugary doughnut holes sits on a table in the lobby, fully stocked at all times. We walk by the table every time we go to our room, to the pool, to the lobby, to the breakfast room, to anywhere. And every time—EVERY time—the boys ask. Sometimes we say no, sometimes yes, but the fact remains: the kids have eaten doughnut holes every day for 4 days. Why? Because they’re there. Before this week, I couldn’t remember the last time the boys asked for doughnuts. They are a rare treat. And not even a favorite treat. But when the doughnuts are right there, free for the taking at all times, eating them just becomes part of the routine. Because they’re there. The hotel also has apples everywhere, and I’ve eaten more than is typical for me. Because they’re there. Before we left on this trip, Tamara bought us all new water bottles. I’ve been carrying mine everywhere, and even though I’m usually good at hydration, I’ve been drinking even more this week. Because it’s there. The water, the apples and the doughnuts have been a good reminder of a very simple concept: if you want to eat less of the bad stuff, don’t have it around you. And if you want to eat more of the good stuff, keep it constantly accessible. Not rocket science; you just to apply it, day in and day out.